While Stephen Colbert and winners criticized Trump, Twitter wondered whether the Emmys had given Sean Spicer, a central mouthpiece for his administration, a pass. Former White House Press Secretary Sean Spicer speaks onstage during the 69th Annual Primetime Emmy Awards at Microsoft Theater on September 17th, 2017. Donald Trump may have famously never won an Emmy, but he nevertheless succeeded in becoming the most talked-about public figure at the 69th annual Emmy Awards on Sunday night. 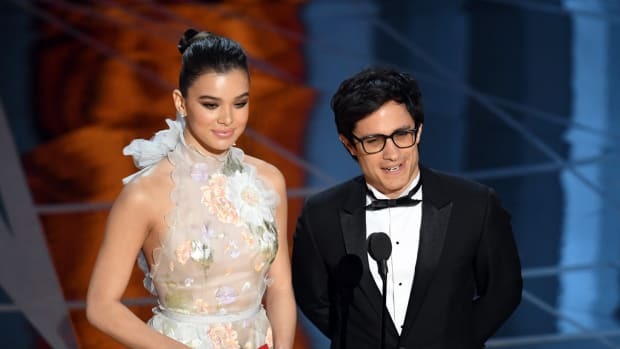 Numerically speaking, the big winners of Tuesday night&apos;s ceremony at Los Angeles&apos; Microsoft Theater were the dystopian drama The Handmaid&apos;s Tale, which won eight awards including Best Drama; the female-centered drama Big Little Lies, which won five including Best Limited Series; and Saturday Night Live, which won nine including Best Variety Sketch Series. Julia Louis-Dreyfus also made Emmy history with her win for Best Comedy Actress for Veep, which gives her the most Emmy awards for the same role ever. 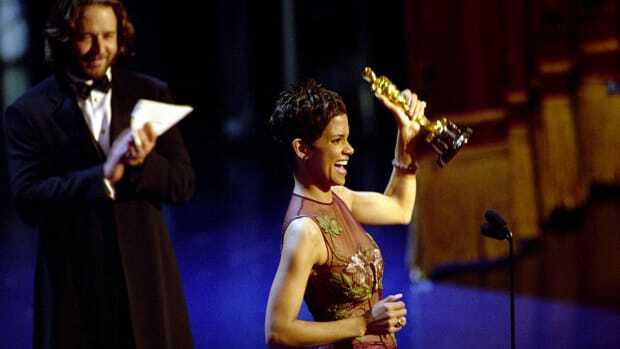 Just as notable as the awards, however, were the politics, which were more salient than in recent years. Host Stephen Colbert set the night&apos;s overall confused anti-Trump tone early with a show-opening musical number called "Everything&apos;s Better on TV." 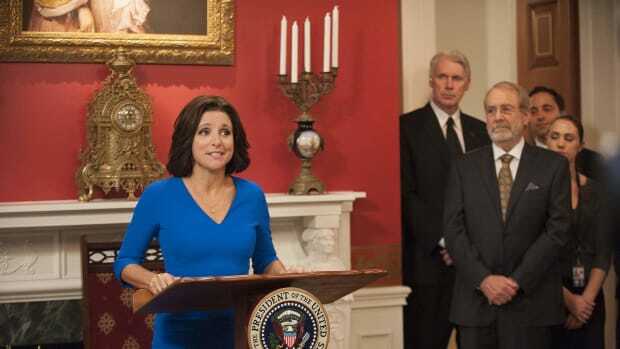 The song ribbed the Trump administration by overlaying scenes from nominated shows with references to similar White House controversies: A scene of Louis-Dreyfus&apos; president delivering a speech on Veep, for instance, was accompanied by the line, "Imagine if your president weren&apos;t beloved by Nazis"; an image from The Americans was accompanied by Colbert singing, "Even treason&apos;s better on TV." Like the show at large, the number attempted to diminish Trump by making him the star of the whole affair—with mixed results. Colbert followed up his sardonic tune with an opening monologue that just couldn&apos;t resist taking a series of primarily listless jabs at the White House. In a moment of tragic admission, Colbert told the audience that the biggest TV star of the last year was, in fact, Trump—not Louis-Dreyfus or any of the other winners—and therefore also Alec Baldwin, whose famously caricatured the president on Saturday Night Live. 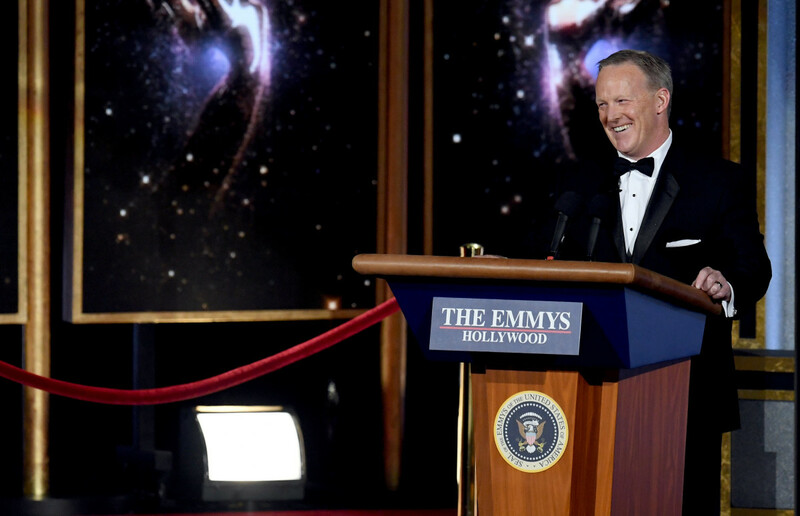 He followed up this line, however, with the night&apos;s most controversial move: He invited former White House Press Secretary Sean Spicer to the stage, where Spicer jokingly proclaimed this year&apos;s show would have the largest viewing audience in Emmys history (the Emmys ceremony has set ratings lows for the ceremony the past two years). The spectacle was clearly meant to mock Spicer&apos;s own inaccurate statement about Trump&apos;s inauguration-ceremony crowd. It also was a strange cameo that anesthetized the Trump-administration critiques the show was handing out in spades. Spicer&apos;s appearance set off widespread criticism on Twitter, with some commentators suggesting that the Emmys were giving Spicer, a former mouthpiece for Trump&apos;s administration, a pass by allowing him to participate in a joke, rather than be the object of it. It also inspired differing narratives from people backstage about how he was being received by the Hollywood élite: Comedian Billy Eichner claimed the former press secretary was playing on his phone alone, while Hollywood Reporter writer Chris Gardner shared multiple photos of Spicer taking photos with and talking to viewers. As this drama unfolded online, acceptance speeches continued the night&apos;s general anti-Trump theme. Accepting his Best Supporting Actor for a Drama Series award, The Crown&apos;s John Lithgow praised his real-life character, Winston Churchill, for "remind[ing] us what courage and leadership in government really looks like." Kate McKinnon—who played Hillary Clinton in last season&apos;s Saturday Night Live—thanked Clinton for her "grace and grit" while accepting Outstanding Supporting Actress in a Comedy Series. Atlanta&apos;s Donald Glover and Black Mirror&apos;s Charlie Brooker also mentioned the president in their awards speeches, casting him in an unflattering light. Baldwin, winner of Supporting Actor in a Comedy Series, proclaimed, "At long last, here, Mr. President, is your Emmy." Besides Trump, the other main talking point at this year&apos;s Emmys was diversity—as Colbert noted in his monologue, this year&apos;s Emmys nominations were the most diverse in Emmy history for the third year in a row. Certainly, the night saw some diversity milestones: Master of None&apos;s Lena Waithe became the first black woman to win for best comedy writing, and Glover became the first black person to win Best Directing in a Comedy Series. But in a notable appearance presenting Outstanding Directing in a Comedy Series Emmy, Dave Chappelle brought some perspective to some of the diversity back-patting: "Truly amazed by how many black people are here. I counted 11 on the monitor?" His joke was met by the audience with nervous laughter. This Year's Emmy Nominations Were the Most Diverse Ever. Again. 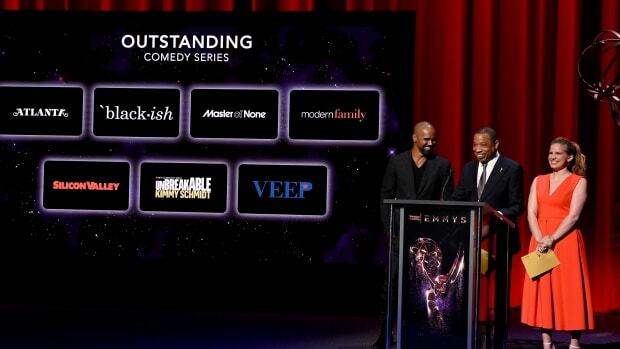 Comedy was the most diverse category, and Limited Series or Movie the least.